This vegan, gluten-free salad from Thoroughly Nourished Life is sure to liven up your weeknight. 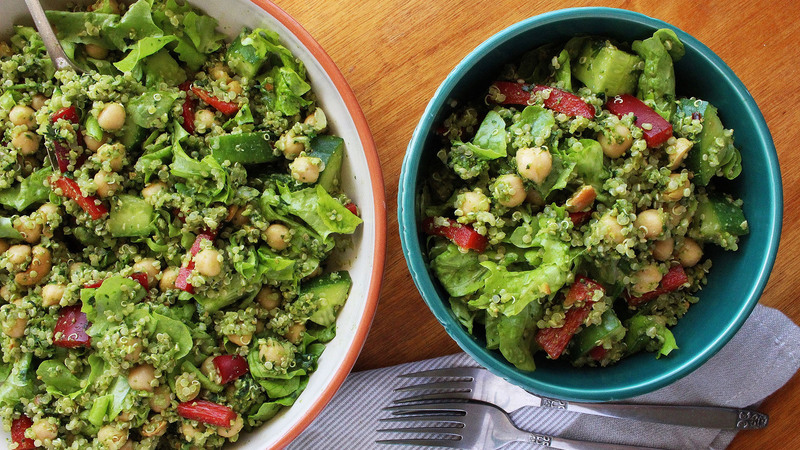 This salad is the perfect trick to have up your sleeve for weekday healthy eating. Gluten-free, vegan, and packed with good-for-your-body ingredients, this salad will have you sprinting over the finish line all week long. We’ve got quinoa, chickpeas, vibrant veggies and plenty of greens too all topped with a flavoursome coriander and cashew pesto. 1. Spread cashews on a baking tray and bake at 180C (350F) for 10 minutes. Cool completely before making pesto. 2. Place quinoa in fine mesh sieve and rinse thoroughly. Place in a medium saucepan with vegetable stock and warm over a medium-high heat. Bring quinoa to a boil. Once boiling, place a lid on the saucepan and turn heat to low. Simmer for 15 minutes then place quinoa into a large bowl to cool. 3. While quinoa is cooking make pesto. Place all ingredients into a high speed blender or food processor and blitz until smooth. 4. Rinse chickpeas and add to quinoa. Dice capsicum and cucumber into large chunks and add to bowl. Gently tear butter lettuce into large pieces and add to bowl. 5. Add pesto to bowl and toss salad thoroughly until pesto is well incorporated.